Although Severna Park isn’t properly set along the coast of Chesapeake Bay, the two wide rivers to its east and south are certainly brackish enough to do a good impression. As a stop along the original railroad that connected Baltimore and Annapolis, Severna Park is a relatively old Baltimore suburb, which means it started growing even before the housing boom of the post-World War II years. Between all the miles of residential coastline and all the local marinas, Severna Park is a great place to live for people who work in Baltimore or Washington and who love to swim, waterski, fish, or otherwise spend their days out on the water. However, it also means that there’s a lot of moisture in the air, even in winter. When too much water gets into a house, one way or another, it invites in all sorts of pests, such as termites, carpenter ants, and mold. Fortunately, if water damage or water infiltration has become a problem in your riverfront home, you can contact AA Action Waterproofing for waterproofing or mold remediation in Severna Park, Arnold Cape St. Claire, or anywhere else in the Chesapeake Bay area. While insects and other pest animals need to find a way to infiltrate your home, mold is one step ahead. Invisible, microscopic, and so light they practically float through the air, mold spores can be found just about everywhere outside and in every room of your home. They’re also practically indestructible, and individual spores can last for years without any food or water. This is why the cleanup process is called “remediation:” it’s not about getting rid of all the spores, it’s about bringing the count down to a level that’s safe. The spore count can be unsafe because certain varieties known as “black mold” carry mycotoxins in their spores. In large enough concentrations, these spores can cause allergic reactions in humans, including headaches, nausea, coughing, and other cold-like symptoms. While mycotoxins are only rarely life-threatening, and even then only to the very sick and the very old, your home is one place you shouldn’t have to worry about allergy symptoms and feeling sick. Another issue with mold outbreaks is the damage it can cause to the building itself. While mold doesn’t act as fast as pest animals like termites and carpenter ants, it can slowly infiltrate and damage wood, carpets, and even concrete. Mold doesn’t eat concrete directly, but it can live on concrete surfaces and it produces an acid that eats away at its integrity. If it gets bad enough, the infected area will need to be replaced rather than just cleaned. When you’re looking for mold remediation in Severna Park or anywhere else in the region, you can contact AA Action Waterproofing. Our service area includes Maryland, Delaware, Pennsylvania, New Jersey, D.C., and parts of Virginia. Whether the mold problem is in a recently built apartment complex, an old boathouse, or a commercial building, we can help. Whether it’s a mold remediation in Severna Park or elsewhere, the first step is always to identify where moisture is getting in and remove the problem. No life is possible without water, after all, and that applies to mold as much as anything else. 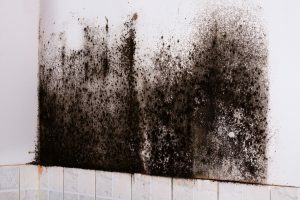 However, mold doesn’t need very much moisture to start growing, and so the problem is often no more than a slow leak in a pipe or Maryland’s humid air condensing in a relatively cool basement or crawlspace. The next step of a mold remediation in Severna Park is to clean up the mold colonies themselves. We quarantine the area so that none of the mold spores can get out and settle in other parts of the house, and after that we clean or remove all the locations affected by the mold. Sometimes it’s enough to wipe off the surface with industrial-strength cleaners, but other times we may have to remove and replace entire sections of the house. Living near Chesapeake Bay is great if you enjoy spending time on the water, but at the same time you have to make sure water doesn’t spend too much time in your home. If you’re in need of mold remediation in Severna Park, Annapolis, Kent Island, or anywhere else along the shore, you should look up AA Action Waterproofing. We have a stellar record with the BBB and plenty of satisfied customers, and our first estimate is always free.